Soft US employment data weighed on the greenback. US Nonfarm Payroll report expected to show that the economy added 205K jobs last month. Multiple US employment reports, which came in below the market's expectations, weighed on the American currency this Thursday, although escalating trade concerns limited its decline against European currencies, with risk aversion dominating the scene. Stocks were in free-fall all through the different sessions after Canada arrested Huawei CFO for extradition to the US, exacerbating tensions between China and the US. Government bond yields dropped, with the yield of the 10-year Treasury note breaking below 2.90%, while oil resumed its decline with the back and forth around future output cuts. Fear ruled. US employment data, relevant ahead of the Nonfarm Payroll report to be out this Friday was overall disappointing, with the only positive number being the November Challenger Job Cuts, which showed that the number of planned layoffs totaled 53,073, below the previous 75K. The ADP survey for the same month showed that the private sector added 179K, below the expected 195K. Initial Jobless Claims for the week ended November 30 were up to 231K, while the Unit Labor Cost rose by just 0.9% in Q3. Nonfarm Productivity in the three months to September came in as expected at 2.3. Better-than-expected services index did little to calm the mood. The week will end on a high note, with the EU releasing Q3 GDP and the US the Nonfarm Payroll report. The US economy is expected to have added last month 205K new jobs, while the unemployment rate is seen steady at 3.7%. Wages are foreseen up by 3.1% YoY. 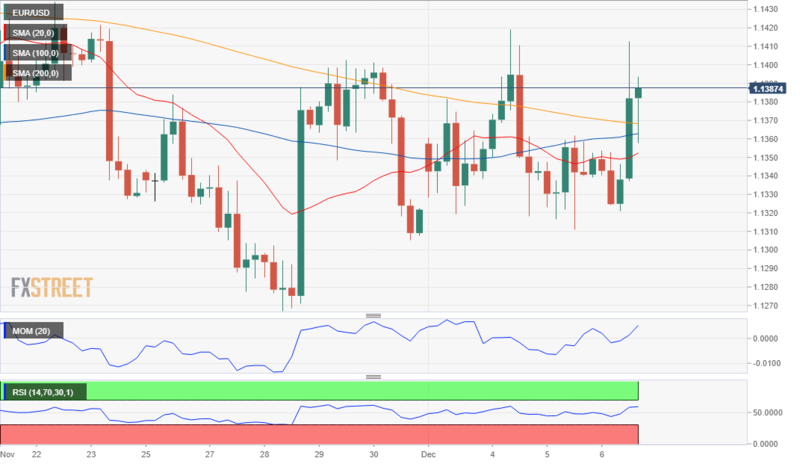 The EUR/USD pair hit a daily high of 1.1412 but retreated to the 1.1380 price zone, where it stands ahead of the Asian opening. The peak stalled below the weekly high of 1.1418, as investors are unwilling to push it outside its recent range ahead of key data and due to the ruling political uncertainty. Having been ranging for over a week, the short-term picture for the EUR/USD pair is neutral, according to technical readings in the 4 hours chart, as the Momentum indicator heads modestly higher below its 100 level while the RSI consolidates above its mid-line, rather reflecting price action than indicating certain directional strength. In the same chart, the price settled a handful of pips above a congestion of directionless moving averages, leaning the risk toward the upside. Still, the pair would need to clearly break above the 1.1420/30 region to be able to attract more buying interest.